"The Deborah Zall Project: In the Company for Women," Martha Graham Studio Theater at Westbeth, 55 Bethune Street, 11 fl., May 13, 2016. Erica Dankmeyer in "Amanda, choreographed by Deborah Zall, inspired by "The Glass Menagerie" by Tennessee Williams. Photo by Jonathan Slaff. 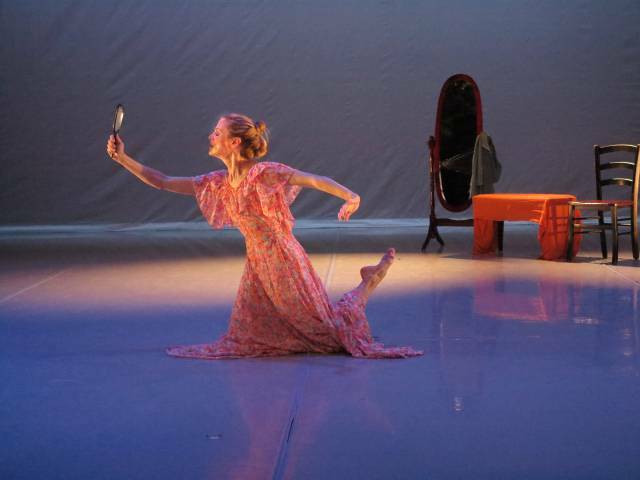 On May 13th and 14th, the Martha Graham Studio Theatre in Westbeth featured a full production of The Deborah Zall Project: In the Company of Women. A long-established choreographer, Deborah Zall is heavily influenced by the iconic Martha Graham, and is a former member of the Martha Graham Dance Company. Leaving this group long ago to pursue an independent career as a soloist, Zall has been invited back to the Martha Graham Studio Theatre to re-stage the poignant solos she once left the company to create. Through six different works, Zall employs dramatization with fine, elegant movement. Often shaped by literature, Zall's work focuses on the “mental journeys of 'fallen women' characters of great dramatic works.” Zall adds that these portrayals are also part memoir, adding a touch of personal, felt affect. The opening solo of the night, titled “Amanda,” is inspired by Tennessee Williams's The Glass Menagerie. A woman is alone in a room. She looks at herself in a standing mirror and delicately puts her hand on her head. Touching on domesticity, aging, and femininity, she is in a pink, ruffled housedress, holding a hand-mirror up to her face. She collapses and rolls on the floor while looking at her reflection, seeming to reach for something that is lost. Letting her hair down at one point and putting it back up at another, she performs antsy legs with a serious face. In the Martha Graham style, these pieces carry a particular tension and vulnerability that is palpable. "The Deborah Zall Project: In the Company for Women," Martha Graham Studio Theater at Westbeth, 55 Bethune Street, 11 fl., May 13, 2016. In an excerpt from "Remembering George Sand: La Bonne Dame," choreographed by Deborah Zall, Geraldine Johns acts an excerpt from George Sand's poetry. Photo by Jonathan Slaff. In another solo titled “Sonnet,” influenced by the work of Edna St. Vincent Millay, a dancer explores grief, as a narrator stands stage-left and reads lines such as, “Time does not bring relief.” Harsh movement conveys the emotional undertones of the piece. A foot is awkwardly turned in toward the dancer's body. She leans half of her body toward the ground, looking up with an arm extended, touching something that isn't there. The minutiae of the movement in her fingers is pronounced. Through slow, intentional movement, many of the works in this production brilliantly invoke the life that exists within negative space, via an engaging interplay with the performers' bodies. Another visually striking thread that runs through the movement in these pieces is a drawing from the midline. Creating circumferences with limbs, movement calls to mind some version of Da Vinci's Vitruvian Man. In “George Sand”, the soloist wears a black velvet dress that beautifully showcases these circles and half-circles, as the dress twirls, both in the air and as the performer creates intricate movement on the floor. The performance ends with two separate duets, the first choreographed by Anna Sokolow, who is featured in the production as an homage from Zall to Sokolow. With sky blue costumes and dappled pink light, the ease of movement and the layered, tender interactions between the dancers is reminiscent of a landscape painting. While much synchronicity in dance can be seen through multiple performers aligning themselves onstage, the movement in Zall's solos exhibit spectacular parallel structures in singular bodies. Sharp lines and mirrored movements with individual limbs create rich displays. A unique design of their own, Zall's solos are a miraculous order, and how significant and historical a stage the Martha Graham Studio Theatre is for Zall herself. Lori DeGolyer is a Brooklyn-based writer.